Backup PC and forget all troubles touching the matter of data protection. Ransomware attacks? No way, just restore your crucial data from computer backup drive. Hard disk destroyed? Sad but nothing critical; download your online computer backup onto a new disk! Handy Backup can do it all, and much more! The simple, convenient graphical user interface (GUI) allows making a task for backup My Computer folder in just six clicks. Advanced options and modes are also available, allowing saving online computer backup, making automatic backup by schedule in an interval from a minute to some months, etc. Besides using traditional local destinations such as a hard drive or an external USB drive to backup computer files, Handy Backup allows backup files on PC online, using such storage as FTP servers, NAS units, network shared folders and clouds (OneDrive, Google Drive and Dropbox are examples). Handy Backup always stores all backup copies in native formats, unless these copies are encrypted or compressed. This approach allows using PC backup copies just from storage folders, requiring no restoration for browsing, opening, sorting, changing, deleting or even restoring these copies manually. Automatic computer backup with Handy Backup allows you protecting your files either by internal encryption or by using protected data transferring protocols such as SFTP, FTPS or cloud API (e.g. for different S3 clouds). 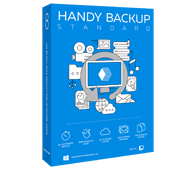 Handy backup protects your computer backup systems and files in all levels! How to Backup Computer Files Data with Handy Backup? Backup “My Computer” content using the next instruction as a guide! Creating a task for PC auto backup is very simple with an assistance of a task creation wizard. Open Handy Backup and make a new task by using a button on the control panel. 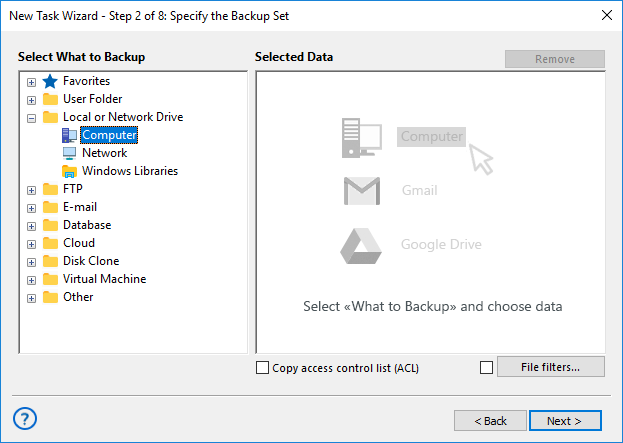 On the Step 1, select “Backup” as a task type. Do not mark “Use Advanced Wizard”. Click “Next” and go to the Step 2. Here, click onto the “Computer” on the left panel. You will see the “Select data…” dialog. Here, find and mark files that you want to back up. When finishing, click OK. Return to the Step 2 window and click “Next”. On the Step 3, select storage to backup computer files. Click onto it and select a backup folder. Again, click OK, and then click “Next”. Continue clicking “Next” until the final step. On this step, give your task a name and finish the task creation. That is all for simple, manually operated task designed to backup files on PC. 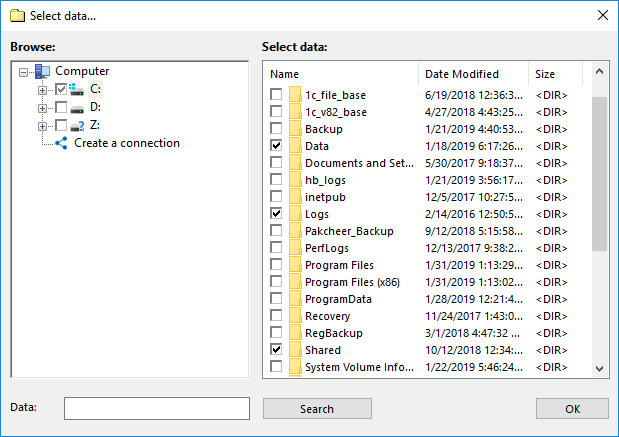 If you need for some advanced backup options, please learn the User Manual to set up and use these options such as partial backup, storing versions, scheduling, encryption and running other software during PC backup. Note: Some of these options are available only in advanced task wizard more. Therefore, if you need for those options, select the “Use Advanced Wizard” option on the Step 1 before you continue! Even the simplest Standard edition brings all convenience, logic and simplicity to be best PC backup software for a home user who wants to protect all data from a single PC! Besides basic operations like creating backup PC files, Handy Backup allows much more automated operations with computer backup data. Some of these operations are available in all editions of Handy Backup, where others require purchasing separate plug-ins or elder editions of the program. Centralized server network backup over a single console. Saving databases, virtual machines and whole drive images. Making “bare metal” recovery of saved computer backup drive via a USB flash drive tool. Synchronizing data between two folders, either for online or local storage methods. Another method of computer backup means defining and saving only crucial parts of the information, not all the machine as a whole. For example, to migrate from one Windows-based machine to another, you must only backup computer files and libraries, not a system or a whole drive content. Most users often store their vital data into user folders and Windows libraries. Therefore, if you looking for a best way to backup computer, you can just save your libraries and user folder content to some secure place, restoring these data when you need it. You can also save any file(s) and/or folder(s) located on your computer. Use file filters with name masks and wildcards like “*” to automatically find files you need. Alternatively, you can just browse your filesystem and pick data you feel appropriate to back up. The last way of partial backup is to save data from a particular application. For example, Handy Backup can automatically backup MS Outlook data, including mails, contacts and events. In addition, you can create a copy of Windows registry, containing data from many applications. In your hands, Handy Backup can be best computer backup software for all types of your data! Try it immediately by downloading a 30-day free trial version with all plug-ins and options!